The Honorable Leona Aglukkaq, Minister of Health, today announced that the Government of Canada, through its Economic Action Plan, is continuing to support the creation of health information systems designed to benefit Canadians by saving time and lives, while also creating economic stimulus. Support from Budget 2009 will assist Canada Health Infoway in implementing electronic health records. It will also speed up the implementation of electronic medical record systems for physicians, as well as connect hospitals, pharmacies and community care facilities. "An electronic health record system will improve the safety and accountability of the overall health-care system," said Minister Aglukkaq. "It will save time and lives by reducing duplication, improving the management of chronic disease, improving access to care and boosting productivity. This will result in a positive contribution to Canada's economy, including the creation of thousands of sustainable, knowledge-based jobs throughout Canada." Many other countries are following Canada's adoption of electronic health records, which give health-care providers a complete picture of their patients' health history and help them to provide better care. Electronic health records will also help to reduce wait times by speeding the flow of information through the system, eliminating duplicate or unnecessary tests, and reducing hospital stays due to adverse drug events. Automated alerts and reminders will help to reduce medication errors and remind health-care providers of necessary tests or vaccinations. 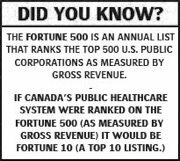 Funding of $500 million announced today is in addition to $400 million in support provided to Canada Health Infoway in Budget 2007. This brings the Government of Canada's total commitment to this initiative to $2.1 billion. Since its inception, Infoway and its provincial and territorial partners have made good progress in making electronic health records a reality in Canada. Across the country, increasing numbers of Canadians and health-care providers are gaining access to health information through secure electronic systems. "The Government of Canada's continued investment in the development of electronic health record systems across Canada will result in continued modernization of the health-care system, with tangible results for Canadians in every corner of the country," said Richard Alvarez, President and CEO, Canada Health Infoway. "In addition to benefiting the health system, electronic health records are also reducing operating costs and stimulating the economy by creating thousands of jobs." Canada Health Infoway is an independent, not-for-profit corporation established in 2001 to accelerate the development of health information and communication technologies such as electronic health records (EHR's), telehealth, and public health surveillance systems on a pan-Canadian basis. Its members are the 14 federal, provincial and territorial Deputy Ministers of Health. 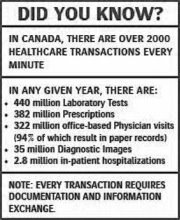 The government-funded organization works to accelerate the adoption of electronic health records in Canada. Its new e-health certification aims to make consumer health vendors bake more security, privacy and interoperability features into their applications. Canada Health Infoway is launching a new certification service for vendors who create consumer e-health applications. The non-profit organization hopes its new e-Health Certification Service will encourage health IT vendors to take advantage of the considerable progress Canada has made in setting standards and deploying interoperable electronic health records. With interest in consumer health products continuing to grow, ensuring these solutions work well with technologies used to store Canadian health data is essential. These products can help individuals organize their health information and gather medical records from doctors, hospitals and pharmacies. It can also help doctors keep up-to-date on changes to your digital health records. Bernard Courtois, president and CEO of the Information Technology Association of Canada (ITAC), also applauded the national standard and said it could boost the confidence of the market considerably. “Our ultimate goal is that buyers of these systems, especially the health organizations, will make it a mandatory requirement in their buying process to purchase consumer health platforms certified by Infoway,” she said. Maloney, however, did not want to comment on the specific costs vendors can expect to pay for going through the certification process. Courtois said that whatever the costs might be, they need to be affordable in order to allow smaller companies a chance at becoming certified. Reid added that by creating cost-effective – but also well-respected – national standard, vendors can truly differentiate themselves and improve the e-health application market.